What a difference a year makes. Last year it rained so much the first two weeks of November I didn’t go hunting. My back yard stayed about a foot deep in water for weeks. Lakes, and my ponds, were full and muddy from all the rain. About this time last year when I finally got in the woods I could not cross the creek between my two ponds. It was full to the banks and flowing fast. Water was running over the upper pond dam. Friday I went down there and walked across it barely getting my boots muddy. My lower pond is about three feet low, as expected. But the upper pond, the one that usually drops faster and further than the lower one, was full. And the water was a milky color. Not sure what is going on. I need to check the spring that feeds it and see if it caved in or something, making it flow faster and adding silt to the water. There are lots of jokes about how dry it is but the drought is no joke. I didn’t even try to plant fall food plots for deer this year, and I think they all left my area. Other than acorns, there is nothing much for them to eat. And the acorns have quit falling. Last year I had Austrian Winter Peas, clover and wheat greening my field. This year it is brown and crunchy. And several folks that spent a lot of money on seed and fertilizer in late summer say their food plots never came up, it was just too dry. I checked to see if it was legal to put tubs of water out for the deer, and it is. But the deer don’t really need to come to the one I put out since nowhere on my land is further than a few hundred yards from a pond of creek. I moved one of my climbing stands down to where I can see the trickle of water between the two ponds. That is the only place I have seen any sign of deer, but the tracks in the soft ground around the creek may have been there for a long time. Sitting on the hillside overlooking the creek Friday morning I thought “why would a deer even be here?” There is some water, but there is lots more nearby. And the hillside has a couple of small privet hedge bushes on it and a little honeysuckle for them to eat, but other areas have a lot more of those two winter foods for them as well as one of their favorites, green briar. I decided where I was hunting was like fishing on a flat, muddy bottom a long way from deeper water. There is nothing much to attract bass in a place like that and there is nothing on that hillside to attract them, either. I guess it is time to move to another area. I need to kill a couple of does for the freezer before the end of season. This entry was posted in weather on November 30, 2016 by ronniegarrison. First, I cast a diving crankbait like a LiveTarget Threadfin Shad Magnum Crankbait (http://livetargetlures.com/freshwater/threadfin-shad-crankbait1) tight to the weed edge and quickly crank it down, then slowly bounce it along bottom. Occasionally, I pause to throw slack in the line, which causes the lure to turn and often triggers a strike. Casting crankbaits is a great way to pluck aggressive bass off the spot. After the initial flurry dies down, I toss a Carolina rig into the hot zone. My typical rig consists of a pegged sinker, 24-inch, 12-pound monofilament leader, 3/0 hook and either a creature body or Northland Fishing Tackle IMPULSE Fatty Tube (http://shop.northlandtackle.com/soft-plastics/impulse-fatty-tube/), rigged weedless. You can slowly drag the rig or let it rest in place, allowing the river’s current to activate the soft plastic. I use 13 Fishing’s 7′-11″ Envy Black Crankenstein (http://www.13fishing.com/envy-black/) casting rod with 10-pound mono for crankbaits, and their medium-heavy 7′-1″ or 7′-4″ Omen Black (http://www.13fishing.com/omen-black-omng215/) casting rod with 30-pound Northland Bionic Braid (https://shop.northlandtackle.com/line/) mainline for Carolina rigs. This entry was posted in Bass Fishing, How To Fish on November 9, 2016 by ronniegarrison. Every year I try to warn hunters to check their deer stands carefully before using them. You can get hurt in many ways, and deer stands account for the majority of hunting accidents every year. A couple of weeks before season I checked all the bolts and nuts on my climbing stands, tested the plywood and canvass to make sure everything was strong, then hung them on the trees I usually hunt. I climbed up removing any new twigs that might be in my way and also made sure my shooting lanes were clear. I then went to my tower stand and climbed it. The wind made it rock some so I went back down and made sure feet were tied down, and leveled them. I then went back up and checked for wasps, made sure the chair was in good shape and didn’t squeak when turned, and made sure I could still see the areas where I expected a deer to appear. I went right by the box stand in the middle of my field several times but never stopped. I don’t hunt it until December, when deer are more likely to come to food plots after all acorns are gone, and where I expect to see does only. The wind was so bad Saturday morning I decided to get in the box after all. When I got to it in the dark I shined my flashlight all around and spotted some old wasps nest. I cleared out spider webs with a stick and eased inside, checking under the chair and everywhere else I thought wasps might hide. Wasps get off their nests and get in cracks in wood or under anything they can when it starts to get cold. They try to survive the winter that way. But on a warm day they will get active during the winter. I had a very bad experience many years ago that has made me paranoid about them. Uncle Adron took me hunting when I was about 19 and told me to climb up in a tower stand on an old fire break. It was a fairly warm afternoon and I was almost sweating when I got to the top and settled in the chair. There was carpet on the floor to dampen any sound. For some reason I moved a piece of it in the corner. There was a solid red mass slowly moving under it. I swear it looked like thousands of wasps! I carefully lowered the carpet and didn’t move. No wasps came out from under it so I stayed put, too. I have no idea if a deer came by that afternoon since all my attention was on that carpet all afternoon! Saturday morning as it got barely light enough to see there was something dark crawling on my thigh. I knew immediately it was a wasps and thumped off. When I turned on my flashlight to kill it there were about six crawling on the floor and walls. It was too cool for them to fly or move very fast. I killed all of them. I kept checking as it got lighter and lighter and saw no more. But at about 9:00 I felt something crawling on the back of my neck. I knew it was a wasps and did not want to hit at it, but was afraid it would crawl down under my shirt. When I tried to brush it off I could feel a very light sting. I killed it and stayed in the box another hour without seeing any more wasps. When I got home I ask Linda to check my neck. There was a small red spot she touched but it was not where I had felt the sting, it was right on the scar tissue from my surgery. The next morning my neck was swollen in two places, the one where I felt the sting and the one on my scar. I guess there are no nerves in the scar tissue to let me feel the pain. I have heard stories of folks being in stands way up trees on in towers when they woke up a snake. So far I have not had that problem. But I did almost have to heart attacks one morning while deer hunting. My stand was on the far side of a clear cut that had grown up with weeds about knee high. I was walking across it before daylight with my 30-30 on my back, shining my flashlight on the ground to stay on the path. As I made a step a covey of quail flushed beside my foot. I guess it was a good thing my gun was on my back or I probably would have emptied it at the unknown critter. It is unreal how much noise a covey of quail flushing from under your feet in the dark make! I stood there a few minutes and my heart finally returned almost to normal, and I realized it had been quail. About ten steps later another covey of quail flushed. That almost did me in. I don’t know how long I stood still breathing deeply, trying to recover my wits. I was afraid to take another step in case I found another covey! I finally made it to the tree and climbed it and settled down. I don’t think I saw a deer that day. I may have been shaking so hard the tree was trembling all morning, scaring the deer away. Sometimes the most memorable things about a deer hunt have nothing to do with deer. This entry was posted in Hunting on November 8, 2016 by ronniegarrison. Venice Louisiana has to be one of the best if not the very best location in America for both inshore and off shore fishing! Factor in the ability to pursue inshore species all year long such as Redfish, Sheepshead or Tripletail and these three alone are enough to entice most anglers. However, inshore angling in Venice has many more species to offer within its shallow grassy contours, such as Speckled Trout, Flounder, Black Drum and even largemouth bass. Cruising through the narrow channels framed by tall walls of canes sends flocks of various bird species to flight. Then without warning these narrow channels open up to backwater ponds ranging in size with varying depths of crystal clear water. Scanning the pond areas reveals thick clumps of vegetation scattered throughout the opening. Pockets and coves filled with matted grass intertwined with lily pad fields and stalks of cane beckoning anglers to cast in every direction. The Venice tidal water environments comprise of twisting and turning salt marsh channel networks offering forage and predatory species an abundant assortment of mixed vegetation for shelter and ambush points alike. Schools of Mullet’s are endlessly on the move, leaping out of the water, while swimming full speed through the channels and around the backwater ponds. If you have experienced the heart throbbing thrill of hard pulling striped bass making long never-ending runs, then you will surely enjoy battling Bull Redfish. Just when you think these Bull Reds are ready to come aboard they suddenly peel drag from your reel making long head thrashing runs over and over again. Patience is the key to success with Bull Reds! Bull Redfish are normally 30 inches or longer and may range anywhere between 15 to 40 plus-pounds. While Bull Redfish normally are attracted to rocky jetties, outcroppings, manmade structures and oilrigs, during the winter months it is not uncommon for bulls to move near-shore or inshore. Juvenile Redfish (Under 30″.) mostly occupy inshore estuaries all within the ‘Marsh’, cruising sand bottoms and grassy areas feeding on oysters, crabs, shrimp, mullets, pinfish and mud minnows. However, these energetic bottom feeders have been known to inhale topwater baits. I utilize the same tackle arsenal for either bull reds or juvenile redfish. Long rods are imperative for keeping pressure on redfish and your hooks pegged. Reels with larger spools holding more line eliminate being spooled, while the parabolic action of your rod absorbs the hard thrashing runs of a big bull red. When it comes to preferred redfish baits, most seasoned anglers keep it simple. Plastic 3″- 4″- 5″ MinnowZ and DieZel MinnowZ impelled unto pointed jigheads such as the TroutEye and RedfishEye jigheads are most common. 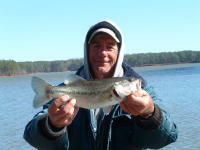 The pointed jighead allows your bait to come through vegetation and canes easily when pitched or flipped into pockets. Retrieve speed varies depending upon the activity level, at times a slow crawl with a sudden hop in your cadence triggers strikes. The advantage of ZMan’s ElaZtech buoyant material to float up off the bottom when impelled unto ZMan’s Redfish Eye Jigheads, TT Lures HeadlockZ HD, Jig HeadZ, or Top Brass’s ‘Super Spike’ Jighead (www.TopBrass.com), all make for the perfect natural presentation when chasing bottom-feeding Redfish. A few other baits that produce well include; ChatterBait’s, Z-Man’s DieZel ChatterBait, DieZel Spins and one of my ‘now’ favorite hard baits Rat-L-Traps. More often than not all of these baits favor long cast to trigger reaction strikes, especially when sight fishing or when redfish blowup on schools of baitfish. When it comes to eating redfish they are delicious! And, as with most edible fish there is a slot size that offers the best taste. Louisiana limits an angler to five-redfish per day, with a minimum length of 16 inches and only one of these five redfish may exceed 27 inches. Anglers anticipating a redfish dinner prefer redfish within the twenty to twenty-five inch lengths. Captain Mike Frenette at www.RedfishLodgeofLouisiana.com or call Captain Mike @ 1.504.78.0924. This entry was posted in How To Fish, Saltwater Fishing on November 6, 2016 by ronniegarrison.